Peanut Butter Breakfast Cookies are a healthier way to eat cookies for breakfast. Save money and skip buying those expensive breakfast cookies at the store by making your own at home. 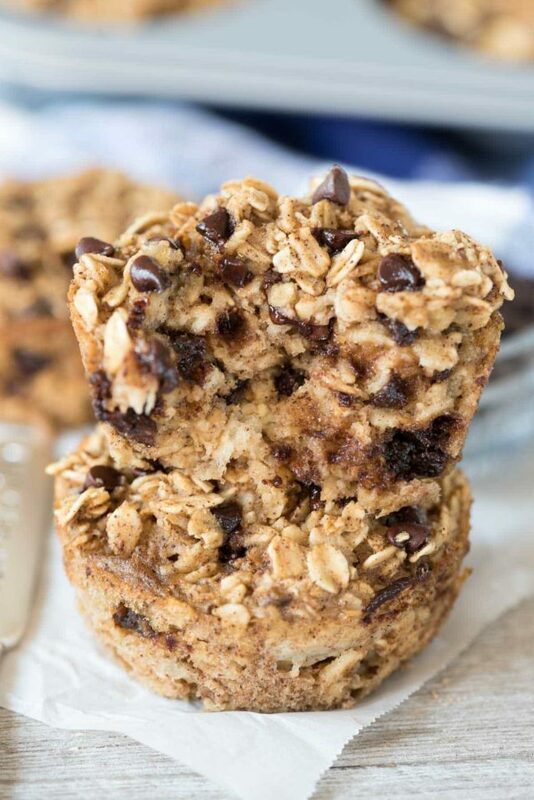 Kids and adults alike LOVE these easy breakfast cookies! Breakfast and snacks are always hard for me. I’m not usually very hungry in the morning so I eat cereal, which leaves me starving after I exercise. 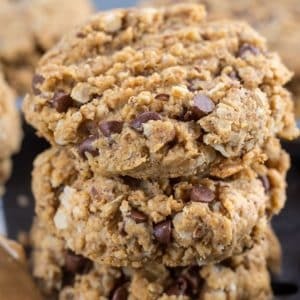 These peanut butter breakfast cookies make the best snack for me for a quick bite after my workout. Have you shopped the snack and granola bar aisle lately? There are so many breakfast replacement and granola bar choices these days and my daughter loves them all. Most of all, she loves the breakfast cookies. They’re not super bad for her so I’m okay with her having them but they’re so expensive: often $5 for 4! That’s why I created this recipe, to try and make a snack that she likes so she can have her cookie for breakfast but without all that cost. I made banana breakfast cookies years ago and they got rave reviews, so I decided to make our favorite flavor this time: peanut butter with chocolate chips! 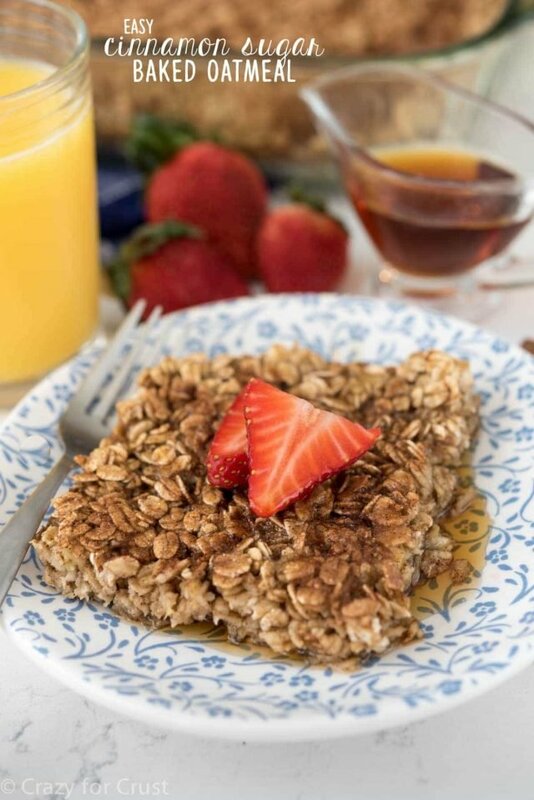 Peanut Butter Breakfast Cookies have a bunch of healthy ingredients like whole wheat flower, oats, and flax seeds, making them a better choice for breakfast! These cookies look like cookies. But they’re much healthier than regular treats…so you can eat them in the morning. I added mini chocolate chips because if I can have chocolate for breakfast I’m a happy girl, but you can leave that out. 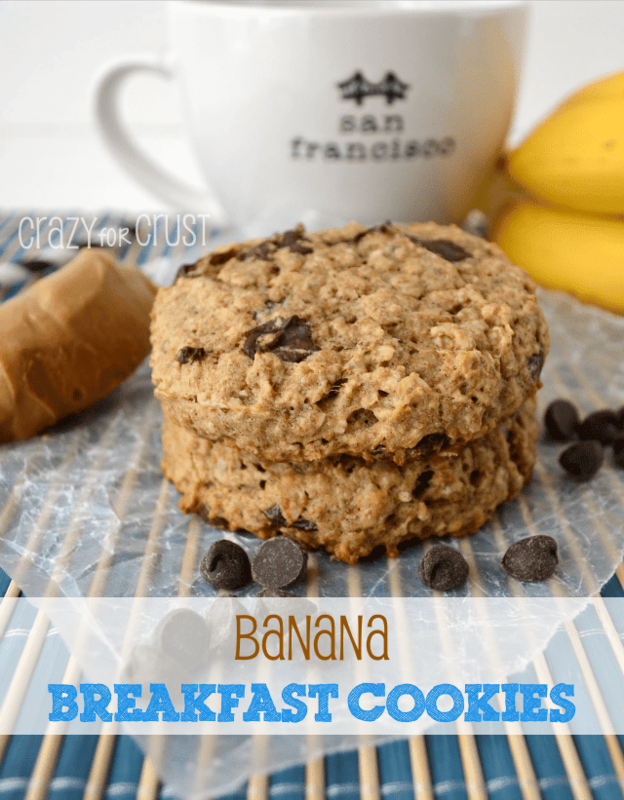 Healthy breakfast cookies for the win! I use a bit of brown sugar for sweetness and a touch of oil for binding, but the rest of the ingredients are better for you. Plus, when you make breakfast cookies at home you get to control the ingredients! Each cookie with chocolate chips is about 160 calories; without them they’re about 130. They pack over 4 grams of protein per cookie. Now, I know that 160 calories is a lot but how many cookies can you say have 4 grams of protein? Not very many, I’m sure! These would also be great for an after school snack. They’ll satisfy the kids’ requests for cookies, but keep them full until dinner. They’re slightly sweet but not overly so and are very satisfying. They’d even satisfy a sweet tooth after dinner without wrecking your diet. These are very crumbly when they come out of the oven. They’ll firm up as they cool so don’t remove them from the cookie sheets until they’ve completely cooled. 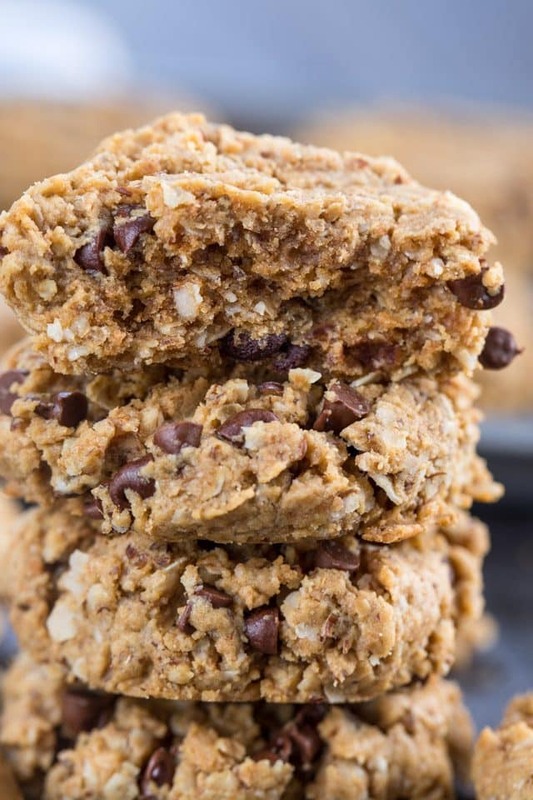 They’re not a chewy regular cookie, they’re more like a cross between granola and those easy gluten-free peanut butter cookies in texture and taste. Just wait until they’re cooled to move them, then they’ll stand up to holding. Preheat oven to 350°F. Line a cookie sheet with a slipat baking mat or parchment paper. Using a stand or hand mixer, mix peanut butter, brown sugar, and oil until smooth. Stir in egg, then mix in baking soda, flaxseed meal, oats, and whole wheat flour. Stir in chocolate chips (optional but yummy). Using a 2 tablespoon cookie scoop, scoop uniform size balls of dough onto your cookie sheet. They won’t spread, so they can be semi-close together. Press down slightly with the tines of a fork. Bake for about 9-11 minutes, until the bottoms start to get golden. Do not remove from cookie sheet until they are cooled. These are very fragile until they have time to set. They’ll still be more crumbly than a normal cookie, but will stay together once cool. Great for breakfast or for an after-school snack! Store in an airtight container for up to 3 days or freeze for up to one month. Oh my goodness these look heavenly!! Can’t wait to make these!! I’ve just made them and they’re amazing! But I’ve used 2 eggs instead of one. Can I substitute agave nectar for the brown sugar and still have them turn out ok? I just made these! SO good! I substituted old-fashioned oats, which made the aftertaste a little bitter, but I still like them a lot 🙂 Thanks for sharing! The “dough” is SO crumbly. Hard to work with. Would adding another egg help? Or more peanut butter. Looks more like granola but hoping to get it into cookie form. I’m sure it’ll be delicious regardless of how it comes out. You can try adding more peanut butter or an egg, for sure. I know my dough was crumbly, but not so dry I couldn’t form cookies. They don’t spread at all and the batter was not like a normal cookie dough! I’ve never worked with GF flours. You can try using GF flour or oat flour. If you do, let me know how it works! I used natural peanut butter and my dough was so dry I could not form cookies. I wonder if I used a non-natural organic creamy peanut butter if I would have better luck? I always use regular peanut butter in all my recipes (unless natural is specified). My favorite brand is Skippy Naturals (which is a traditional no-stir peanut butter, like regular Skippy, without all the gunk). That’s most likely what happened! Have you ever made them smaller and used them as cereal? Wondering if they would stay together once milk is poured over them?